as i am sure you've guessed, josh and i frequently order delivery... one of my favorite places to order from is soupbox. 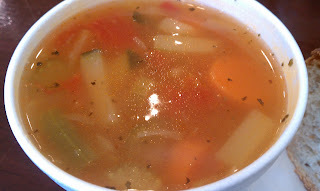 they've got a variety of soups that change daily... and you get a big chunk of either sourdough or multigrain bread with your soup. mmm! soupbox is really great about their ingredients... everyday without fail there is at least one vegan soup available... they also differentiate between vegetarian and gluten-free, which i think is awesome. **you can also get grilled cheese and cookies there, but those obviously aren't vegan. hearty fresh vegetable with multigrain bread. this particular soup is pretty basic... but so so so fresh tasting. it's definitely one of my favorites from there. i almost brought some vegan butter in a baggie... but i thought it might get some looks, so i refrained. my actual favorite soup is the indian masala tomato lentil... give me that with a chunk of sour dough and vegan butter... mmm! the best winter day meal! it's super delish... and very healthy! plus and plus! i also like the cuban black bean, which they also had at this visit. but it's not that pretty to photograph, so i skipped it. it's pretty basic, but nice and filling if you are extra hungry! 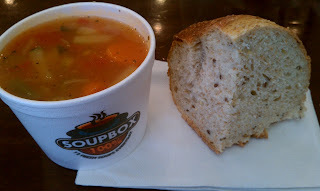 soupbox gets an a+ ... can't wait for another "souper" cold day (like what i did there?) to order some soup!